Looks like George Russell will be running in the morning and Robert Kubica in the afternoon on the first day and the reverse on the second. 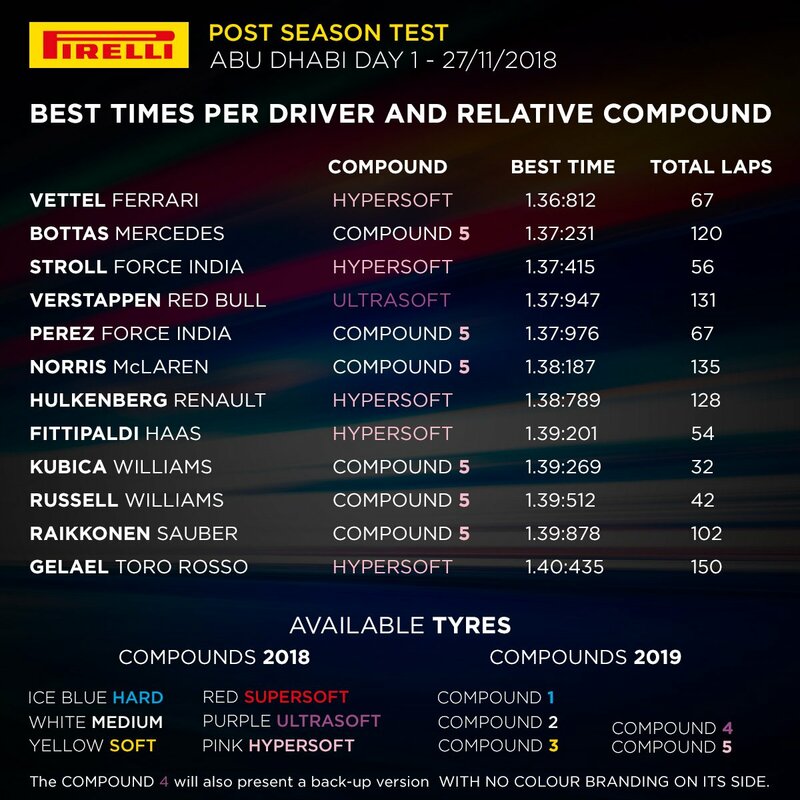 Given that it is really a Pirelli tyre test session for their 2019 tyres I am not sure how we will view the results. Edited 1 time(s). Last edit at 27/11/2018 04:38 by Andrew Hooper. Both drivers will get much needed mileage on the current car. George: "It was a very exciting morning. We didnt have any issues and we've gathered a lot of data. I'm very excited with working with Robert". "With the experience and technical knowlege of Robert and my own experience from Mercedes we can offer Williams a lot". "The team is very open. There is no George's team and Robert's team. In this test we are doing different programmes. We wont be compared to eachother." Q: Are You preparing for intra-team battle with Robert? A: "Absolutely not! Our mutual target is to push the team to the midfield. If I will end up 19th and Robert 20th it's nothing to be proud of". Edited 2 time(s). Last edit at 27/11/2018 09:34 by ihme. We are giving Kubica more time (+2h) than previously planned. George will ltake over in an hour. I have to say I'm as excited for next season as I was for 2014. The feeling of having 2 serious drivers in the car, a fresh start technically, it's probably the first time in years I am looking forward to winter testing. Great day for Us! Cant wait till winter testing! Robert Kubica: The focus was on the 2019 Pirelli specification tyres, it was very important to understand what’s the difference and if there is any difference. At the moment we are testing in very hot conditions, but winter testing and the first few races will be different conditions. We will go through the programme we ran over the last two days, and I’ll sit down with the guys and George to decide on the tyres for winter testing and the first four races. Additionally, it was a good opportunity for me to get back in the car, to go through different tyres, but also to warm up the muscles before we recharge our batteries. Winter will be long, and we will prepare over this time ahead of the upcoming season. I am working well with George. He is very nice guy, and we have a good collaboration which is key for us and for the team. All in all, the test was good, and I am looking forward to 2019. George Russell: I am very pleased with how my first test with Williams has gone, overall it was very positive. It has been fantastic to get to know everybody and gain an understanding of how the team works, and of course driving the car. I was pleasantly surprised with how the car was feeling and I think we made some good steps ahead of 2019. The tyre test was very beneficial to the team, they have gathered some really good information, which provides a great idea going into the first test and races. Working with Robert during the test was great, he has so much engineering knowledge from his past experiences. I believe we can have a positive effect and push the team in the right direction to get more performance. There is no time to rest over the next few weeks, I will be very busy attending events such as the Autosport, BRDC awards and a Mercedes event. On top of that, a lot of work in Grove with Williams, and preparing for the 2019 season to make sure that I am physically prepared come the test. With the limited time Russel has had in the car he seems to be showing real promise. Plus I like the way he is talking Kubica up.